Be the first to share your favorite memory, photo or story of James "Pete". This memorial page is dedicated for family, friends and future generations to celebrate the life of their loved one. 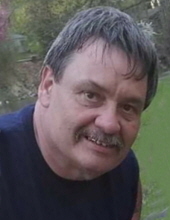 Age 54 of Owosso passed away Wednesday, January 30, 2019 at his home. Funeral Services will be held 6:00 pm Saturday, February 2, 2019 at Nelson-House Funeral Home with Pastor Timothy Whalen officiating. Burial will take place at Hillcrest Memorial Gardens. The family will receive friends at Nelson-House Funeral Home on Saturday from 2:00 pm until the time of service. James "Pete" was born July 21, 1964 in Owosso, the son of James and Margaret (McNamara) Sexton. He graduated from Owosso High School, class of 1982 and attended Bible Baptist Church of Owosso. Pete was active with the Conservation Club with the kids and loved "his" Walmart. He was an avid hunter, fisherman and outdoorsman. Most of all Pete looked forward to time Up North, camping, campfires and story telling with family and friends. Pete was employed through the years as a truck driver. He is survived by his wife Kristina; step-son Jonny (Megan) Villasurda; mother-in-law Teresa Flynn; sister and brother-in-law Marla (Jeff) Wilcox; nephews Michael and Nik Tithof and niece Ava Wilcox "his kids"; special aunt Chris Hallock; many nieces, nephews and other loving family and friends. He was predeceased by his son Keith, his parents and sister Debbie (Dave) Mitts. Memorial contributions are suggested to the family or the Shiawassee Conservation Club. To send flowers or a remembrance gift to the family of James "Pete" A. Sexton, please visit our Tribute Store. "Email Address" would like to share the life celebration of James "Pete" A. Sexton. Click on the "link" to go to share a favorite memory or leave a condolence message for the family.